MICHAEL CONLAN will face former world title challenger Adeilson Dos Santos in his homecoming ﬁght on Saturday June 30 live on BT Sport. His ﬁrst seven ﬁghts have taken place in the United States but Frank Warren is bringing him home to the Odyssey Arena on another brilliant ﬁght night in Belfast. Conlan’s return to his back yard is also the featherweight star’s ﬁrst ever ten rounder and another step towards him emulating Irish greats and becoming a world champion. Conlan hasn’t boxed in his home city since December 2010 when he lost a controversial decision in the Ulster Senior Championships. He said: “It is an honour to be boxing at the Odyssey Arena and an even bigger honour to be headlining the card. Brazilian Dos Santos, 26, has won 19 of his 23 professional and last year challenged Jessie Magdaleno for the WBO super-bantamweight title. On a previous British visit in 2014 he lost on points against Kid Galahad over 12 rounds and promises to give Conlan a tough night. 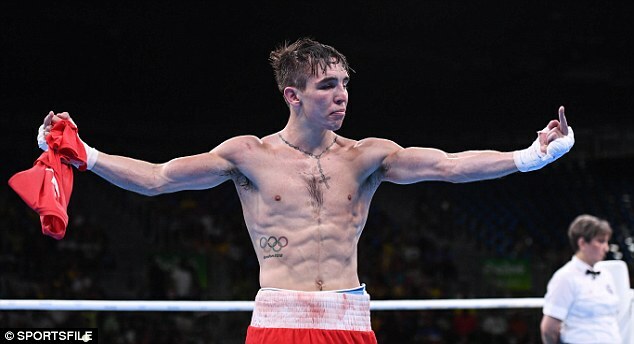 ‘The Conlan Revolution,’ as it has become known since the Irish Olympian turned professional under the Top Rank banner in March of 2017, will come across its sternest test to date. Conlan added: “Dos Santos has competed at the highest level and this ﬁght will be my toughest ﬁght as professional to date. “He has challenged for the world title, made Kid Galahad work, but I believe it’s a test I am ready for. The undercard has produced one of the most competitive undercards ever seen in Belfast with a catalogue of 50-50 needle showdowns. World ranked Jack Catterall risks his WBO super-lightweight title against Belfast’s Tyrone McKenna. There is a brilliant all Dublin rematch when Jono Carroll defends his IBF intercontinental crown against Declan Geraghty. When the warring rivals met in November 2014, Geraghty was ahead on the cards when he was disqualiﬁed in the fourth round. Belfast’s Paddy Gallagher faces recent world title challenger Gary Corcoran in a British welterweight title eliminator. In a clash of unbeaten hopefuls, Derry’s Tyrone McCullagh meets Glasgow’s Joe Ham in vacant Celtic super-bantamweight title clash that doubles as a British championship eliminator. The undercard is stacked with top prospects including Lewis Crocker, Sunny Edwards, Padraig McCrory, Taylor McGoldrick, Neslan Machado, Garry Cully plus Johnny Coyle and Lewis Benson who clash over ten rounds.